Together with our partner cities we promote the vision of cities sharing solutions. It seems obvious, but today even the most successful solutions such as public bicycle systems scale at a pace that reached just 0,1% of communities in over 10 years. Over the past 3,5 years we have learned much about the barriers, but have also found some solutions to overcome them. So, when we talk about cities becoming more open, agile and empathic it is because they fundamentally do two things: open their problems and share solutions. When you imagine this model applied to 557,000 communities and 10% of world GDP, it would be an incredibly active marketplace. We remain far from it, but after running more than 90 challenges with global cities we are, ourselves, impressed to see just how actively cities collaborate to solve their problems. And in many ways, this is just a beginning. Increasingly, as at our recent Cities Summit hosted together with the Mayor of London, cities are making much bolder commitments to open problems and share not just solutions, but the methods that will transform their procurement. Citymart.com is primarily considered a government to business marketplace, helping cities procure smarter by getting full exposure to all approaches to meet their needs. But Citymart.com also provides a very important asset for citizens in opening up a decision-making process typically handled behind closed doors. This, in fact, is quite revolutionary. If we take a look at traditional public spending in cities, we find that rules and regulations focus on the correct tendering process, which legally starts when you send out your specifications to solution providers for bidding. In most global cities, these are today published. What the citizen doesn't know, and cannot know, is how the need that this investment is to solve comes about, how the specification was determined, and whether preferences were given to certain types of providers in the process. The process of identifying the need and specifying the tender are still treated as 'discretionary', i.e. it is up to each official to do this as they please - which usually means doing it behind closed doors, constitutes a breeding ground for bad practices and wastes public resources. Each city working with Citymart.com receives a methodology on how to identify needs, or as we call them: challenges. Many cities, such as Sant Cugat or Cape Town, have chosen to run challenges to find new methods to engage citizens in determining priorities. Genius!York and Mindmixer are to examples of solutions now being used by cities to engage citizens in prioritizing city needs. Cities publish their challenge on Citymart.com, as for example the 22 partner cities of LLGA2013 did - meaning that long before specifications are done, cities share their intentions. All information is public, and cities commit to publishing local press releases to assure citizens are informed. Citymart.com takes these challenges and proactively invests in a 3-month research process, to find all available solutions. Citizens can follow and interact with the research team on our Storify feed, and through our extensive social media campaigning. Not only can they see what we find, but they get access to valuable background resources to learn about the key issues. Special emphasis is given to explore all possible approaches to solving a challenge, a key feature for a public debate on how we would like our cities to develop. All solutions that are submitted to a city are published, meaning that citizens can see exactly what options their public leaders had when they considered their course of action. This is an unprecedented step forward. Citymart.com is an open catalogue, meaning that any citizen can search relevant solutions for their needs and interact with providers, or share these with other members of the community. Citymart.com provides cities with a jury tool, to which they can invite decision-makers, but also members of the public or civic leaders in an effort to arive at best decisions. In fact, Citymart.com provides cities recommendations on diversity and composition of juries. Citymart.com documents the jury behaviour, and each member of the jury has clear guidelines on potential conflicts of interest. Should citizens seek information about any part of the process, the data is available and can be shared on instruction by the city. Names of Jurors are published on Citymart.com, to provide full accountability. Each solution provider receives the original jury evaluations directly in their showcase. As a result of this openness, like in many other aspects of open information, cities have become more considerate in how they frame their needs and interests. In our experience of running 87 challenges, cities are increasingly moving away from technical concepts to citizen value and impact concepts. See our related article on the Rise of Citizen Engagement. Further, Citymart.com creates opportunities for citizens to take matters into their own hand. McKinsey has shown that in Dublin, for example, Citymart.com would be a significant opportunity to create new start-ups that respond to the challenges and needs of the community. 90% of challenges on Citymart.com are won by SMEs, of which about 25% are NGOs or citizen organisations that have the most meaningful solutions to community challenges. Citymart.com, the world’s leading marketplace for cities today announces an investment deal with Norwegian investor Tharald Nustad through his investment company Plastillin. The deal, which values the company upwards of $3M, is designed to secure the next phase of growth and development as well as the long-term independence of the marketplace by a deal equally emphasizing governance, social impact as well as solid opportunities for return. Citymart.com follows the vision of helping 557,000 global city and local governments to use their spending and regulatory powers to greater effect for the good of citizens around the world. This is achieved by building a fair and open marketplace connecting cities, vendors, organizations and citizens. Citymart.com counts 50+ global cities as its customers, such as San Francisco, London, Lagos, Barcelona, Fukuoka and Moscow. Citymart.com founders Jakob H Rasmussen and Sascha Haselmayer welcomed the deal which concluded a fundraising process which exceeds the general pattern of startup-to-venture investment seen in most markets. Through a rigorous process of identifying an investor who, in addition to interests to invest in a venture, is also committed to helping secure the venture’s social impact, the independence of the marketplace and scalable growth are secured. As an Ashoka Support Network member, Tharald Nustad was drawn to the investment opportunity because the partnership with Citymart.com represented a commitment to social impact, company viability and venture growth which is being fostered by leading social entrepreneurs that are alleviating a major challenge effecting cities, governments and citizens worldwide. Ashoka, the world’s largest organization of leading social entrepreneurs and changemakers, played a key role in matching the investment needs of Citymart.com with a social impact-oriented investor and member of Ashoka Support Network – a global network of successful business leaders focused on changing the world with changemakers. The investment of $1M will give Tharald Nustad an equal share to Citymart.com’s founders, who are committed to a common social impact purpose. It will also enable the creation of an independent conflict-resolution organization that will protect the marketplace from conflicts of interest and manipulation, as well as help Citymart.com to further develop its online tools (e.g. localization functions, project validation systems), which have been adopted by 25 global cities to date and are revolutionizing the accessibility of public contracts for SMEs and start-ups. Citymart.com will use the investment to further develop its online tools such as localization functions, the validation system for project references, today adopted by 25 global cities that revolutionizes access to public contracts for SMEs and start-ups. Further, Citymart.com will extend its program of strategic partnerships such as the 2-year partnership with Moscow announced in November that will help reform the $25 billion annual procurement process in the city. Citymart.com helps cities collaborate and share in new and highly scalable ways providing technology platforms, methods and policies that to-date have helped create the world’s largest catalogue of high-impact urban and social innovations; the adoption of common reporting standards on sustainability. Citymart.com has shown that local government procurement and regulation could be made at least 10% more effective by adopting more open opportunity or problem based approaches and providing fairer access to opportunities to new ideas, approaches and businesses. Founded in 2011, Citymart.com is based in Barcelona and Copenhagen and counts more than 50 global cities among its clients, discovering more than 10,000 solutions to city challenges in the past 3 years. With more than 1,200 social and urban innovations published by providers around the world in the Citymart Showcase, the platform constitutes the most complete global catalogue of solutions for cities today. 39 urban deployments initiated by Citymart.com reach more than 33.5 million citizens in global cities such as Lagos, Barcelona, San Francisco or Boston today, notably improving access to open data, tourist experiences, road quality or urban energy and lighting systems. Plastilin AS is a private investment firm working with startups in the fields of digital technology and communications. Our philosophy is that a great idea needs to be supported by good values, positive organizational culture and capable management to achieve success in business. It is essential that we understand the technology, concept, organization and industry for us to add value to the venture we invest in. We engage in strategic development of the portfolio companies in addition to capital. Tharald Nustad is a Norwegian private investor and main owner of the investment firm Plastilin A/S. He has been an entrepreneur in several tech startups and is actively engaged in all the portfolio companies of Plastilin. Tharald is also a member of The Ashoka Support Network Scandinavia. There are numerous initiatives and programs that target underprivileged communities. A wide variety of academic studies, economic analyses and policy briefs that list out recommendations to break the cycle of poverty have been written. And many governments around the world, such as those in Latin American countries, have federal agencies specifically dedicated to design and implement social policy for poverty reduction. Efforts come from the developed and the developing world, from different levels of government, from large international organizations to local NGOs and grass-roots associations. And yet, despite the amount of effort and resources, the process to achieve the main goal – ending poverty - seems to be moving slowly, and there is an urgent need to accelerate it. We often hear about cooperation but it hardly materializes into concrete actions. We need to land those initiatives and translate ideas and good will into action. This requires changing the paradigm through which we have envisioned the end of poverty and making the shift away from the traditional models. In recent years, we have witnessed the expansion of a phenomenon called “urbanization of poverty”. As cities continue to grow, the number of pressing needs increases in all fields, from health to public infrastructure and utilities, transport, education and employment. At the same time, citizens have changed from being passive service recipients, to key actors that get actively involved and demand transparency and results to their governments. How can cities improve the services they deliver to their communities in a faster way? In the era of knowledge and information, we have the very powerful tool of technology to deliver change. As Sascha Haselmayer, CEO and co-founder of Citymart.com, acknowledges “there is great technology out there and it is in everyone’s hands; these technologies are scalable and can transform societies”. These words were pronounced at the 8th Forum of the World Alliance of Cities Against Poverty (WACAP) that took place in Dublin earlier this year, to introduce the Program “Cities Pilot >>> End Poverty”. This two-year Program is designed by Citymart.com and Dublin City Council to find the most innovative technologies to end poverty and implement them in real life. The World Alliance of Cities Against Poverty (WACAP) and the United Nations Development Program (UNDP) endorse the Program. The process starts by finding the 30 most committed WACAP member cities that share the values of innovation, collaboration, openness and transparency. Selected cities will join forces to call for the most innovative solutions to empower our communities. Citymart.com gives cities the tools they need to get inspired by worldwide social and urban innovators to find solutions to their most pressing challenges. In order to achieve this, our team’s expertise provides cities guidance to identify a specific problem and frame it as an opportunity. Together we define the city challenge in a way that attracts global response from social and urban innovators, and which is published as a global call for solutions on our virtual platform. Once the call is open for submissions, our dedicated research team starts a proactive outreach campaign to discover worldwide solutions that have the potential to address the city challenge. Each submission to the call is a commitment by a provider to co-invest in a community to implement a high-impact pilot, if selected as the most promising solution. Research findings are documented and shared with cities in real-time, so that their officials, representatives, stakeholders, and citizens can participate. Cities are also encouraged to communicate this opportunity to their local community of social and urban innovators. In order to select the solution that best meets the city’s needs, we help cities to coordinate a Jury composed of a minimum of five members and at least one international representative. All submissions will be evaluated, five of them will get nominated, and the most promising one will get selected. Citymart.com sets up the technological tools to assure an accessible, transparent and straightforward evaluation process. The campaign results are announced at the Dublin Summit in February 2014, where cities and providers get together to express their commitment to implementing the selected solution on the ground, while they share how innovation turned a local challenge into a global opportunity. This is a unique experience for both, cities and providers, to network and kick-start new collaborations in their communities. Most importantly, the ideas get translated into actions, as the selected providers actually demonstrate their innovative solutions in participating cities. A pilot is a cost-effective way to test the chosen solution, which allows cities to make better-informed decisions and smarter investments. In two years from now, cities will meet again at the WACAP Forum in 2015 to collaborate and exchange results. In this win-win scheme, cities accelerate problem solving through innovation and technology, and social and urban innovators have the chance to implement their solutions to an unresolved need. All participants exchange results as part of a global collaborative community, and facilitate the sharing of high-impact solutions across cities. Together we deliver real change and the outcome is community empowerment and a better quality of life for our citizens. With the revolution over, Cairo citizens are banding together through social media to take on a new challenge -- the city's notoriously terrible traffic. Egypt-based company Bey2ollak has devised a smartphone app that connects users to report on the latest traffic conditions throughout Cairo. In a city where getting from Point A to Point B may easily take 2 hours, Bey2ollak (an Arabic term that roughly translates to "word on the street") is a welcome resource to avoid the most heavily congested roads. And road users aren't the only ones taken with the new app; Bey2ollak was recently awarded first prize in a Google-sponsored competition that sought out Egypt's best start-up enterprises. The functionality of the app is simple, which has likely contributed to its success. Users can post updates through the app to let others know how light or heavy traffic is along a certain route, and they can check the most recent posts for a certain corridor before or during travel. Not only can these features make travel easier for individual road users, but they may also help to mitigate or even reduce traffic congestion along some streets. Those stuck in traffic may use the app to re-route to a less congested road, and drivers who have not started their trip may check the app in advance to avoid traffic altogether. The app can essentially help to spread traffic out throughout the city rather than having it concentrated along a few over-used corridors. Users may also decide to delay certain trips, such as running errands or other non-work trips, if traffic conditions are very poor. Perhaps the most important influence of the Bey2ollak app is its potential to reduce the total number of motorized trips taken within Cairo, thereby reducing overall congestion. Those who see in advance how bad the roads are may weigh the decision to travel more carefully and may simply decide to stay at home or take a shorter trip by foot or bike. In this way, Bey2ollak and other traffic alert apps may provide unanticipated congestion mitigation benefits to urban areas in addition to the intended time savings benefits to individual users. Twenty-one cities from Asia, Africa, Europe, North and Latin America have announced the winners of the Living Labs Global Award 2012 (LLGA 2012) in Rio de Janeiro, Brazil. The Award presented major urban challenges faced by cities such as Barcelona, San Francisco, Cape Town, Mexico City, Birmingham, Rio de Janeiro or Lagos, to which 555 companies from 50 countries responded by presenting their innovative solutions. Cities spend EUR 3.5 Trillion annually in public procurement, and technologies promise major efficiency, accessibility and service quality gains. During the first world meeting in Latin America on the smart use of technologies and services, public leaders from 21 global cities have revealed the winning innovative solutions that best meet strategic challenges like Affordable Housing Units for Lagos (Nigeria), Data to Help Fight Obesity in Eindhoven (The Netherlands), Changing Private Car Use in Lavasa (India), Wireless Control of Urban Systems in San Francisco (USA), a Knowledge Square to enhance digital inclusion in Rio de Janeiro (Brazil), Participation in Service Design and Delivery in Sant Cugat (Spain), Digital Public Transport in Mexico City (Mexico) and Engaging Visitors Experience in Barcelona (Spain). Winning solutions of the LLGA 2012 will now be piloted in the 21 participating cities over the next 12 months, to evaluate their impact to meet the pressing challenges. City of Cáceres (Spain): Sustainable Cities. Motion is Energy, by OTEM2000 - Green Solutions & Management S.L. City of Coventry (UK): HLG SYSTEM, by GLASS COVER Europe S.L. City of Fukuoka (Japan): Smart PathFinder, by Where 2 Get It, Inc. In a unique global effort, 555 technology solutions from about 50 countries submitted to the Living Labs Global Award 2012 in February, while 109 were shortlisted in March. Winners have been selected after an international two-round jury process involving 147 jurors, under the auspices of Living Labs Global, a non-profit association based in Copenhagen and Barcelona working with 50 cities and 1,000 companies around the world to promote service innovation in cities. The Living Labs Global Award is a unique global process providing full accountability in the evaluation through independent experts. The LLGA 2012 was promoted by 21 global cities in partnership with Living Labs Global, Citymart.com, Oracle and The Climate Group. 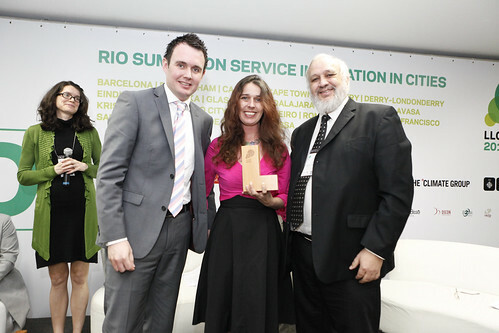 The LLGA 2012 Ceremony of 2 May was attended by 200 participants from 22 countries in Rio de Janeiro as part of the Rio Summit on Service Innovation in Cities. “Today we have witnessed a major commitment towards meeting some of the world’s pressing urban challenges, with the goal of improving the lives of more than 50% of the world’s population by using clean technologies, smart services and better accessibility. The winners will now have the opportunity to implement their solutions in real-life, and work together with stakeholders in the 21 partner cities to prove their impact,” said Sascha Haselmayer, Co-Founder of Living Labs Global. “The Living Labs Global Award 2012 has been an important event for the City of Rio de Janeiro, which will soon host the Football World Cup and the Olympic Games. We thrive upon knowledge and innovation and this Summit exchanges experience and cutting-edge solutions. It has been a very successful event. Through the Living Labs Global Award 2012 we received 109 solutions that will help us to develop our Knowledge Square, which is being implemented in 6 areas of the city and aims to enhance digital inclusion across Rio de Janeiro,” said Franklin Coelho, Secretary of Science and Technology of the City of Rio de Janeiro, host city and partner of the LLGA 2012. “The cities will be considered at the cutting edge of innovation and progress, as contactless technologies and associated mobile services are about to revolutionize mobile usages. They will also enjoy a new two-channel interactive communication tool, visible and accessible to everyone which is particularly important for an emerging global city. Connecthings will be glad to benefit from such prestigious international references and to demonstrate that its solutions are flexible and adaptable to cities’ diverse challenges,” said Damaris Homo, Business Development Manager at Connecthings, winner of four LLGA 2012, including the categories of Rio de Janeiro and Barcelona. “With initiatives like the Living Labs Global Award 2012 we are transforming Barcelona into a platform for innovation. We would like to see successful projects in the city being replicated in others, such as Rio de Janeiro or Paris, to name a few. The city of Rio as the host of the next Football World Cup and the Olympic Games must also think about their legacy and how the infrastructure will bring benefits to its citizens in the future,” said Josep M. Piqué, Strategic Sectors Director, 22@ Barcelona, partner city of the LLGA 2012. “Over 50% of the world population lives in cities and only by having them on our side will we win the battle against pollution and build a better world. We have to disseminate the Clean Revolution to city leaders,” said Molly Webb, Head of Smart Technologies, The Climate Group, partner of the LLGA 2012. On the second day of the meeting, May 3, during the Rio Summit on Service Innovation in Cities, 200 delegates from 22 countries, including public leaders from 30 international cities and pioneering entrepreneurs driving social and technological innovation are engaging in matchmaking activities to foster partnerships and dialogues on the investment priorities of participating cities: Urban Systems & Services, Health & Wellbeing, Open Government & Accessibility, Clean and Green Cities, Tourism & Mobility. On May 4, delegates join LLGA 2012 local immersion programme to experience some of the ground-breaking projects, such as the Change through Digital Inclusion (CDI) programme in the favelas of Rio de Janeiro, now adopted by 717 communities in 14 countries. Citymart.coml is a non-profit association based in Copenhagen (Denmark) and Barcelona (Spain), working with 50 cities and 1,000 companies and research centres in Europe, Africa, Asia and the Americas with a mission to open the market for service innovation in cities and overcoming key technology, organisation and trade barriers. The Living Labs Global Award is an annual process over 8 months in which cities present their challenges and provide guidance to the business and technology community on future investment plans and needs. Solution providers respond by submitting existing technologies as entries for evaluation by an international jury. Some of the winners of LLGA since 2010 include SOCRATA, whose solution has been implemented by San Francisco to power the city’s new cloud-based Open Data site, URBIOTICA’s intelligent waste management sensors for recycling containers and WORRLDSENSING’s cutting-edge urban smart parking solution. More than 557,000 local governments provide services to more than 50% of the world’s population with an annual spending of 3.5 Trillion Euros per year. New technologies can radically improve transport and mobility, urban systems and services, open government, health and wellbeing and other key areas of urban life. As we are nearing our Award Ceremony on May 2 in Rio de Janeiro, when all eyes will be on the 21 winners that have been selected by 21 global cities - such as Barcelona, San Francisco, Rio de Janeiro, Mexico City, Kristiansand, Eindhoven, Lagos, Cape Town, Rome and Fukuoka - we take a minute to recall the journey that took us here. Three years ago, we had an idea. What if cities called for solutions to their pressing challenges? Why was there no place where cities, soon home to 70% of the world's population, could share their challenges? In November 2011 we launched LLGA2012, in partnership with 21 global cities with 110 Million citizens in Europe, Asia, the Americas and Africa. Each city presented a challenge to which our wonderful research team of 10 in Barcelona found 3,500 existing solutions around the world. After a validation, we received 555 entries from more than 50 countries, which were reviewed by 147 international jurors appointed by the cities to 21 juries evaluate the impact of the solutions for each category. This generated 7,500 evaluations and some 45,000 evaluation data-points providing valuable feedback on May 3 to participating solution providers via the Showcases on Citymart.com. On March 5th, the cities and their juries presented 109 nominated solutions that entered a second round of evaluation. On May 2, we will present 21 winners - selected by the cities as the most promising solutions to improve the lives of 110 Million citizens. In the coming 12 months, these winners will implement 21 pilot projects, to show the real impact of their solutions and allow citizens, government agencies, business partners and the partner cities to experience change. Last year, we published this post about MindMixer, an online tool designed to bring citizens and officials together to brainstorm on ways to improve their cities. MindMixer has partnered with over 100 government organizations across the U.S.to provide a flexible, convenient interface for local collaboration. Now the online community engagement service has joined forces with the City of San Francisco and its new Office of Innovation to create ImproveSF, a site devoted to providing ideas for and feedback on municipal projects. San Franciscans can submit ideas to challenges, vote on proposed projects or challenges, and review others' submissions. Office of Innovation staff oversee the proposed challenges and help to judge the submitted entries. Participants are awarded points for submitting ideas, which they can redeem for prizes in the site's Rewards Store. One of the challenges currently open for voting is "What are the best ways for SFMTA to improve your transit travel time?" which includes a list of six possible solutions for citizens to review and comment on. While I would like to see the option to submit an original idea to this challenge outside of the six provided, this sort of online voting system is a great start to encouraging dialogue between San Francisco residents and those in charge of planning and decision-making. Providing an interface that allows for public comment and collaboration 24 hours a day, 7 days a week goes a long way towards opening up discussions that used to be limited solely to public meetings. For those who can't make meetings because of scheduling conflicts or mobility constraints, MindMixer's ImproveSF is especially empowering. More and more cities are getting on board with online community engagement as a way to reach out to citizens for broader, more diverse public feedback. We'll keep you posted on the latest trends from MindMixer and other innovative public outreach tools in the coming weeks, some of which have been submitted for this year's Living Labs Global Awards. Stay tuned! Megacities and large metropolitan areas around the world tend to get all of the credit for being leaders in innovation and technological change. Over the past several weeks, I have mainly focused my posts on these so-called "first-order" cities -- places that are recognizable to most of the world's population by city name alone. London. Rio de Janeiro. Barcelona. Shanghai. These are places that require no introduction and have rightly been recognized for their forward-thinking enterprise. But many other smaller places have been participating in the movement towards becoming smarter, more sustainable, and better connected cities. Some of them are involved in this year's Living Labs Global Awards. LLG's own Sascha Haselmayer discusses the role that these small, smart cities can play in his article, "Technology and Participation Pay Dividends in Smaller Cities," posted yesterday on EngagingCities. When I think of these places getting involved in public service improvements and tech development, the first limitation that comes to mind is the bottom line. Smaller cities simply don't have the budget to compete directly with their larger counterparts. But they do have the resources to collaborate with them, and this is where small cities have the potential to be highly influential. Sant Cugat, a city of 80,000 located outside of Barcelona, provides an excellent example of how smaller hubs of innovation can collaborate with and support the work of a nearby major city and its surrounding region. Sant Cugat rose out of its financial troubles of the early 2000s and began to reinvent itself as a place of good public management, community engagement, and local innovation. Its Local Innovation Plan won a Living Labs Global Award in 2009 and presents an inspiring way to involve citizens in discussions of city planning and development. Sant Cugat has also collaborated with Barcelona to develop technologies and ideas to create more sustainable and resilient cities. You can read more here about Sant Cugat and how small cities can help to promote and develop urban solutions. [youtube=http://www.youtube.com/watch?v=yikjgJnFfTM&context=C435488dADvjVQa1PpcFOJ1wVZFRcV3UIjBc0ZpSVdJIgPEPvH2Zs=] As a commuter cyclist, I'm used to getting questions from people who are interested in the practicality of biking to work or school: What clothes do you wear? How do you carry all of your stuff? How do you keep your bike from getting stolen? This last one is a question that is hard to answer simply, since no lock is 100% theft-proof. Finding decent bike parking can be a problem as well. Depending on your city, it may be hard to find a secure place to park a bike because racks are nonexistent or inconvenient, forcing cyclists to lock to less secure signposts, parking meters, or street trees. Unfortunately, studies have shown that these problems surrounding bike parking are some of the major reasons that more people don't travel by bike. Even just the fear of theft may deter many people from bike commuting. This makes the lack of secure bike parking in our cities not just an inconvenience, but a serious hindrance to citywide mobility. While some cities have started to install secure bike parking pods at transit stations and other high activity locations, in many areas the current options still leave much to be desired. But some cities, such as Barcelona with its Bicibox project, are working to change that. Bicibox is a secure, modular bicycle parking system that is designed to offer safe and convenient bike parking options throughout the city. Smaller Bicibox stations provide 7 bicycle storage spots and take up about the same amount of space as a single on-street car parking spot, while larger stations provide 14 spots. The stations are divided into individual parking boxes, each fully covered by secure sliding doors so that bikes are shielded from weather and risk of theft. Each station is also equipped with an energy efficient console and card swipe system to access a bicycle parking space. The creators of Bicibox plan to offer pay-per-use stations in the future, but as of now cyclists may access any Bicibox station by signing up as members on an annual flat rate basis. What I love most about this solution is that it provides so much more than just safe bicycle parking. Like the latest generation of bike share systems, Bicibox stations are fully networked and provide real-time information on parking space availability to users. Cyclists can use the system's website or the Bicibox mobile app to check for open spots and may search by destination to find the nearest station. By making bike parking convenient, secure, easy to locate, and abundant, innovations like Bicibox make cycling an option for many people who may have otherwise found it infeasible. Eliminating the parking-related barriers to bicycling can go a long way towards promoting better mobility and access to alternative transportation options in our cities. Recruitment Opportunity at Living Labs Global - Design Management Researcher! DESMA is an Initial Training Network funded by the European Commission’s Marie Curie Actions that combines 4 leading universities within the area of Design Management (University of Gothenburg, Aalto University in Helsinki, Politecnico di Milano, and Imperial College, London), 4 leading European design consultancies (Ergonomidesign, Engine, Live|work, Future Concept Lab) and 4 complementary product and service organizations (Volvo Group, Philips Innohub, Poltrona Frau, Living Labs Global) in an unprecedented cross-disciplinary effort to understand how design can be exploited as a driver of innovation and competitiveness in Europe. We are seeking applicants with a master degree in either design or business and some professional experience. The employed researchers will conduct research projects in collaboration with their host organization, take part in a common training programme with doctoral level courses and build a forum for design management research in Europe. Many cities today are striving to create dense, well-connected public transportation networks that reduce auto-dependence, mitigate congestion, and provide a variety of travel alternatives. Unfortunately, the complexity of large transit systems can be daunting even for native residents, especially when users need to transfer from one type of transportation to another. Juggling transit schedules, maps, and route listings just to get from Point A to B can make public transportation an unattractive option for some. Enter the smartphone users, who might say, “Well, isn’t there an app for that?” And they’re right – mobile apps for public transit systems abound. Having access to real-time service information, station locator tools, and interactive maps can make public transit a much more viable option for many. However, in most cities these apps only provide information on a single mode of transportation. If you need to transfer from a bus to a subway line, for instance, you would have to toggle between two apps for schedules and travel times. Taking bike share? Add a third app. And so on. Mobile apps are designed to make our lives easier and save time, but few have been able to tackle the complexities of urban public transportation networks in a way that helps to connect users to the multitude of travel options that cities have to offer. The Travel London mobile app from Urban Times aims to do just that. It provides real-time information on bus routes, tube lines, and bike share stations throughout the city, allowing users to easily compare and combine different travel options. While it’s of course great for residents, an all-in-one transportation app is especially useful for visitors who are trying to navigate an unfamiliar city. Being able to easily find all of the travel information you need in a single place makes a city instantly more accessible and tourist-friendly. And with the summer Olympic Games fast approaching, Travel London is doing its part to make the city an open and inviting place. Dear readers, First, I want to thank you for reading my contributions to the Report on Mobility over the last 2 years. It’s sometimes strange to sit in a room by oneself and write to a faceless, unknown audience. And at the same time the ability to do so reflects the communication- and information-rich world in which we live today whose novelty and strangeness have long since disappeared. The opportunity presented by new media to spread ideas and engage ever-broadening audiences is being leveraged by Living Labs Global and its partners to create a world that is both more efficient and more pleasant to experience. I admire this mission and will carry it with me throughout my future in the practice of planning. As I write this final signing-off post, I wanted to reflect on a few of the big ideas of the past couple years. There’s no doubt that new communications technologies have helped people with constrained time budgets who are geographically distance communicate more often and more efficiently. These same technologies are helping localities engage their citizenry in new ways; politicians are more in touch with their constituents. That said, we have to keep in mind that these advances are complements to, not replacements for, face-to-face collaboration and discussion. Car sharing, bike sharing, even tool sharing have flourished in the last few years. Perhaps as a result of the openness of the online virtual world, people have become more comfortable sharing their personal things – and companies like Relay Rides are giving them financial incentives to be interested, too. The public sector has also encouraged sharing of cars and bikes, highlighting the huge efficiencies to be achieved by pooling resources. Smart cities, intelligent cities, city 2.0: whatever you call it, the way we manage our cities is changing. Real-time data are becoming more and more available whether it’s through mining cell phone location for assess traffic conditions, monitoring bus on-time performance, or remote security and surveillance for your home. Planners in the future will need to design these systems advantageously, to interpret the trends they reveal appropriately, and to make beneficial changes that reflect those interpretations. Living Labs Global itself uses public-private partnerships to forward its mission of spreading good ideas and implementing the best solutions. The success of groups like Code for America and Venture for America demonstrate the public’s thirst for solutions and the private industry’s ability to get things done. Thank you all again for reading and providing insightful comments. I’m looking forward to completing my master’s degree in city & regional planning this spring and getting my hands dirty with planning activities in the San Francisco Bay Area this summer. Please don’t hesitate to be in touch. As part of the European DESMA consortium, we are looking to recruit an Early Stage Researcher to a European doctoral level research training network in the area of Design Management. The positions are full time for three years, starting in September 2012. Opportunities for adding a fourth year for completing a PhD will be discussed separately for each position. DESMA is an Initial Training Network funded by the European Commission’s Marie Curie Actions that combines 4 leading universities within the area of Design Management (University of Gothenburg, Aalto University in Helsinki, Politecnico di Milano, and Imperial College, London), 4 leading European design consultancies (Ergonomidesign, Engine, Live|work, Future Concept Lab) and 4 complementary product and service organizations (Volvo Group, Philips Innohub, Poltrona Frau, Living Labs Global) in an unprecedented cross-disciplinary effort to understand how design can be exploited as a driver of innovation and competitiveness in Europe.